This photo is not awesome, but the cake totally is. Guys- by the time you read this I will be on a plane. OMG. I’m freaking out a little, okay a lot, as I type and schedule this post. Excited, yes, because I can’t wait to see my family and friends. Worried, absolutely, because Lavinia and I have been super sick for the last few days. Bummed, of course, because I’m going to miss my husband real bad. So while I'm consuming airplane and fast food- do yourself a favor and make this delicious fruity goodness just because you can. I’m consider myself more of a cook than a baker because I don't like "measurements." I do have to say I'm quite proud because I totally made this recipe up and it rocks. Admittedly I did get some of the dry ingredient proportions from a few recipes I read online. If you want to get a little cray just add some frosting and viola- a healthy cake. 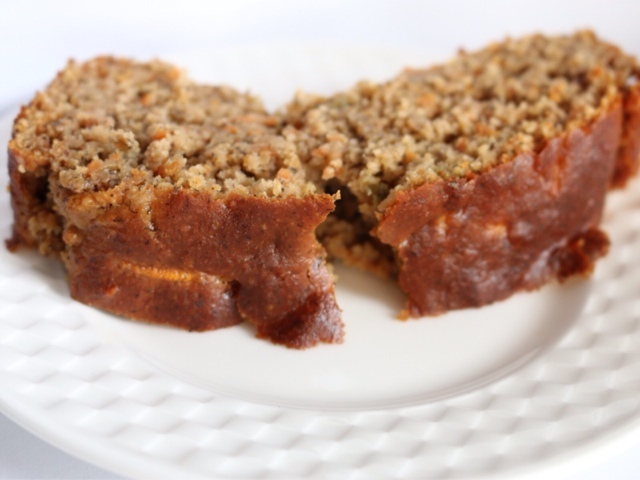 Carrot, Banana, Apple Bread: And it's Oil Free! Right-o. Mix dry ingredients together and set aside. In a mixer or by hand go the eggs, yogurt, bananas, and grated carrot. Slowly add the dry ingredients and fold the apple in last (don't ask me why, but that's what I did). Bake that bad boy in a greased loaf pan for 35 minutes at about 175 C or 350 F (Keep an eye on it and poke in the middle if you're unsure. You could do muffins too! Oh feel better soon, Dawn. It's terrible to be sick and travelling, and it's hard to travel with a kid. My American friend just left for Seattle with her 1 yr old yesterday. YIKES! BTW- just added you to the Blog's I Love page on my blog. AND this loaf looks sooooo yummy! We survived- barely! Being sick made it so much worse but we did it. Now I'm willing the memory to fade. Thanks for adding me to your faves! Back atcha ;) Try the loaf- you'll get your cinnamon fix. Like Tinder but for Mama Dates: Hello Mama's!